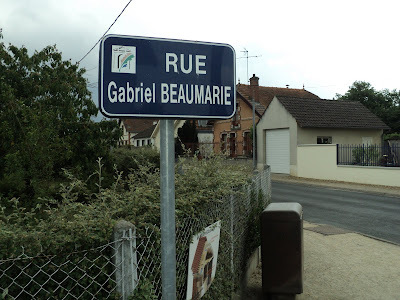 On June 10, 1944, Gabriel Beaumarié should have been spending his birthday celebrating as a young university student home on break with friends. But the brave Fertésien had joined the Resistance a few months before, so instead he was back in town to receive an air shipment of arms. He was accompanied by another Fertésian, Maurice Millet, and about 30 other mostly Parisian students. What Beaumarié didn't know was that there was a traitor among his group. A student they'd considered as one of their own, André Parent, had joined the Resistance in June 1943. But he'd also become a card-carrying member of the Gestapo d'Orléans in March 1944. Parent had sold out on his compadres about the yet-undelivered arms shipment. The unarmed young men were shot at a farm outside town in the early morning hours of June 10th by German officers. 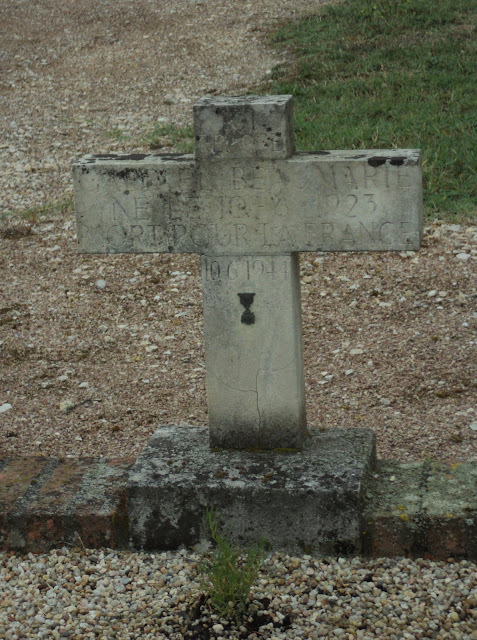 Beaumarié and Millet were among twenty-nine men who died that day at Ferme du By. Another faked his death and survived under the care of local Resistance members. Beaumarié had a promising future. Despite losing his father at age five, he'd been a successful student and was attending a music and choir program at l'Ecole Normale in Paris. In the beginning of 1944, he joined the local Resistance under the direction of Robert LeCharpentier, who was in charge of a group of Tunisian forced laborers at a La Ferté armaments plant. Around June 6, 1944, a few days before his death, Beaumarié helped a Tunisian laborer, Hassad ben Mohammed, escape from the plant. Around that time, the Germans heavily bombed the facility. 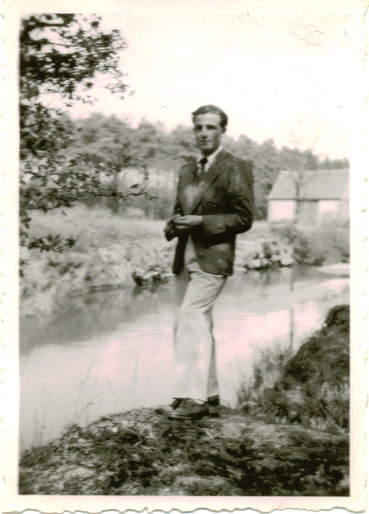 *** Ben Mohammed had accompanied Beaumarié to Ferme du By the night before the shootings, but managed to hide in a pile of hay in a barn and escaped unharmed after the Germans left following the executions. I can't pass by this cross street from our house without thinking of Gabriel Beaumarié's courage. La Ferté Saint Aubin spent four years under German occupation, as we are just an hour and a half south of Paris. The war was almost at an end. The liberation had begun. La Ferté was only about ten weeks away from its own liberation on August 16, 1944. Beaumarié turned 21 the day he died. I'll share more about this day, clearly among the worst in our town's history, in my next several posts. Thanks to help from the town's historical society, I'll provide stories of other Resistance heroes, relate the horrors the town suffered under bombings in June 1940, and show how these victims and heroes are still being remembered today. We can't ever forget. ***Side note: The French later reestablished the bombed-out armaments plant, and I worked at the site from 2005 to 2008 -- teaching English to French people who were working with German counterparts on armaments and civil engineering programs. Very interesting. Looking forward to the next installment!